Digital – a word which is ubiquitous within our industry now and no longer the exclusive domain of IT or marketing. It should not be seen as simply an enabler; intelligent and progressive digitisation is now a fundamental business need in all areas of pharma and healthcare. We present an exclusive webinar with leading global data centre and interconnection provider Equinix, joined by digital and technology experts FFW and moderated by our own Andrew McConaghie. This debate provides practical insight and delves deep into the challenges at hand in managing the digitisation of our industry and suggests how firms can use interconnection to enable the transition. How industry can prepare – why connected is not enough – definition and benefits of interconnectivity, to re-architect the delivery of IT to securely connect partners, customers and employees to what they need across devices and geographies in real-time. The live broadcast took place on Thursday 19th November 2015 at 13.00 GMT (14.00 CET). To view the on-demand version, please click here or on the webinar widget below. Stuart Turnham has over 12 years’ experience working in the Financial Services and Enterprise technology sectors. He joined Equinix in 2008 to manage the EMEA Financial Services business where he helped develop Equinix into the world’s largest exchange colocation and electronic trading interconnection platform provider. Stuart is currently responsible for Equinix’s go-to-market strategy and field development functions across EMEA. He and his team regularly work to advise clients on network, application and system infrastructure colocation and interconnection strategies that enable digital business transformation. 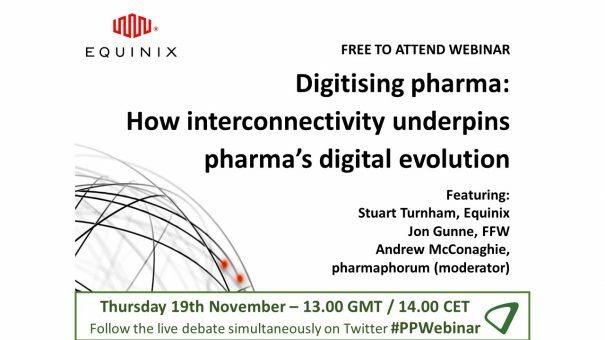 Jon brings with him over 18 years of experience within Pharma culminating as director of the Business Technology digital centre of excellence for Pfizer in Europe. In April 2015 he made the switch to working agency side, joining FFW as the Managing Director of their new UK entity, FFW is a global, full-service, digital agency focused on combining innovation, technology and data to deliver effective digital solutions.